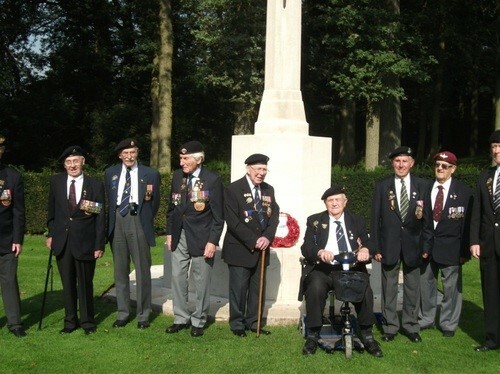 In 2009 Robin Rowbotham wrote a fascinating article for Bishopthorpe.net, describing his visit to Normandy with D Day veterans including his father Roy, who lives in Keble Park South. 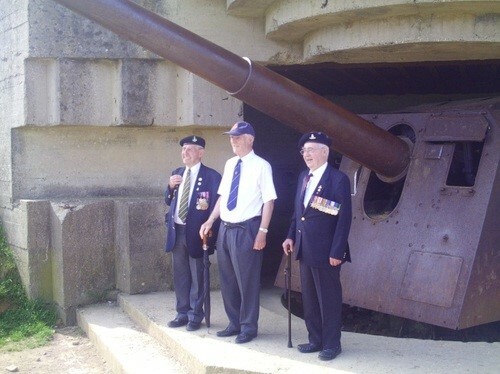 Robin has written a further account of his travels with the York Normandy Veterans Association, and the recent honour of ‘Freedom of Entry’ that the Association has received. 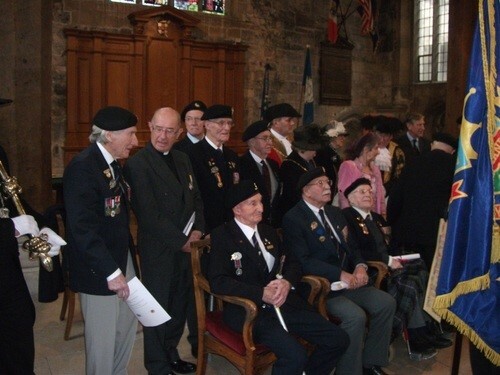 Further to my previous account from a couple of years ago about the York Normandy Veterans Association (NVA) trip to the 65th Anniversary of D Day I thought an update might be of interest. Since the last report I have been fortunate to be able to attend two further visits to WWII battle sites with the gang, acting as official helper for my Dad – well, he’s not as sprightly these days as he was in ’44! Our second trip back to Normandy in 2010 took us to further D Day battle sites such as the Longues-sur-Mere battery and the village of St Mere Eglise, familiar to those who have seen the ‘Band of Brothers’ TV series. However, one must appreciate that D-Day was not the end of the war, just the beginning of the end, and so 2011 saw the Vets remember at a different dimension of their experiences – the Market Garden operation and the final push in to Germany. We travelled through Belgium and Holland traversing the Market Garden route, crossing all the famous bridges that linked Montgomery’s plan for an early finish to the war. The 1977 film ‘A Bridge Too Far’ depicts the struggles fought on these bridges, although this does not compare to hearing a first-hand account from someone so heavily involved. Indeed, one of the most memorable moments of the trip for me was as we stopped at Graave Bridge and made our way to the exact spot my Dad parked and shot his Bofors field gun during the Market Garden dash. The moment was made even more memorable as my eldest son was with us and his Granddad was able to graphically describe the events of the day and the feelings and emotions of the time. My son has a keen interest in modern history, due in no small part to hearing his Granddad’s stories as a child, and is currently studying the subject at UEA. Another personal highlight was the snatched hour spent drinking beer in the lovely German town of Kleve (or Cleves, as in ‘Anne of’). Three generations of Rowbotham savouring a cold beer on a hot day, chatting over events of the near and distant past. This year, I am proud to report that a great honour has been bestowed on the York NVA. On the 25th of January the vets gathered at the magnificent Guildhall to receive the Freedom of Entry to the city of York. Personally it was great to see the gang all back together again, spirits high and the atmosphere jovial, proudly displaying their hard won medals and looking as smart as always. The ceremony started in grand style with a procession of notable York dignitaries, amongst them the Lord Mayor and Mayoress, the Sheriff and the Sheriff’s Lady and the Town Clerk, accompanied by our flag bearer proudly flying the NVA standard. The Lord Mayor began by addressing the congregation; then the full honours were explained by the Town Clerk before the Lord Mayor presented the Freedom scroll to the NVA Chairman, Cyril Howarth. Cyril accepted the scrolls on behalf of the Association and then gave one of his typically stirring speeches to the entertainment of the audience. Each Vet then received their own scrolls, personally presented by the Lord Mayor and Sheriff, every one accompanied by a round of applause from the gathered crowd. The whole ceremony was a very moving occasion and the pride of all the family and friends was evident around the room. We then all retired to the Mansion House for a sandwich lunch and a series of toasts and speeches praising and recognising the Vets for their contributions through the war years and beyond. It was particularly pleasing to see Branch President, Major General Cordingly, make the journey up from London and the obvious pride he displayed as he toasted the group was evident to all. Finally, I’d just like to thank York City Council for bestowing this deserved honour. It was a brilliant day for all involved and I felt so proud knowing my Dad was being acknowledged for his sacrifices and bravery over half a decade ago. Special thanks must go to Brian Watson, Honourable Member and Ex-Lord Mayor, for providing the impetus and drive to make it all happen. 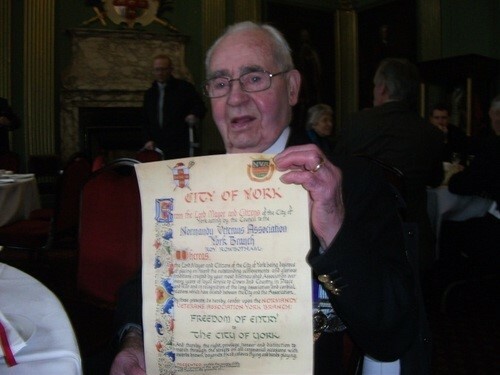 As for my Dad, he is truly honoured to have received Freedom of Entry citation but is a little disappointed it doesn’t give him the power to herd his sheep through the City of York!